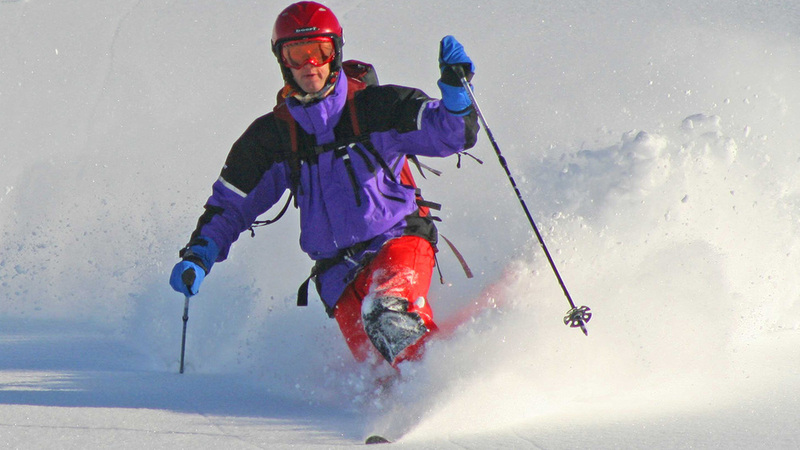 Backcountry ski skills including telemark and nordic instruciton and a full range of skills for backcountry touring. Key ingredients go into making a ski day one to remember. Great weather, cold dry snow, and distant untracked powder glades are some. Another ingredient is the skill set you bring to this perfect day. Watching videos of skiers shred almost vertical lines on distant Alaskan peaks, although inspiring, can also be daunting and beyond most skiers ability. What is in your reach though, is that special feeling you get when your skiing skill comes together on this perfect day. When you have been working on a particular elusive skill you just couldn't get, and suddenly you really feel it. That perfect rhythm and the sense of floating, almost dancing, down the fall line, and you look back at a perfect line of turns and the smile on your face just gets wider. Our Backcountry Ski School can help you with just that special feeling. Whether you are new to Alpine Touring gear, powder skiing, want to improve your telemark skills either on or off piste, or just wish to feel the rhythm of kick and glide as you almost effortlessly cruise along the trials. Please see below for details and come to our shop in Furano, 100 metres from the Kitanomone gondola to book your lesson or day of backcountry learning with our experienced and qualified guides and ski instructors. Rates. Lesson and Skill's day's rates are per person. For non private lessons, rates are a sliding scale from 1 to 6 persons. Contact us for detail pricing. Required Equipment. For all lessons and backcountry skills, skis and skins are included from our shop, Alpine Backcountry Rental in Furano. For Telemark lessons, boots are also included.